Pad Thai or Phat Thai (Thai: "fried Thai style") is a dish of stir-fried rice noodles with eggs, fish sauce, tamarind juice, red chilli pepper, plus any combination of bean sprouts, shrimp, chicken, or tofu, garnished with crushed peanuts, coriander and lime, the juice of which can be added along with Thai condiments. Two different styles of Phat Thai have evolved: the dry, light version found in the streets of Thailand and the version that dominates restaurants in the West, which is heavier and oilier. 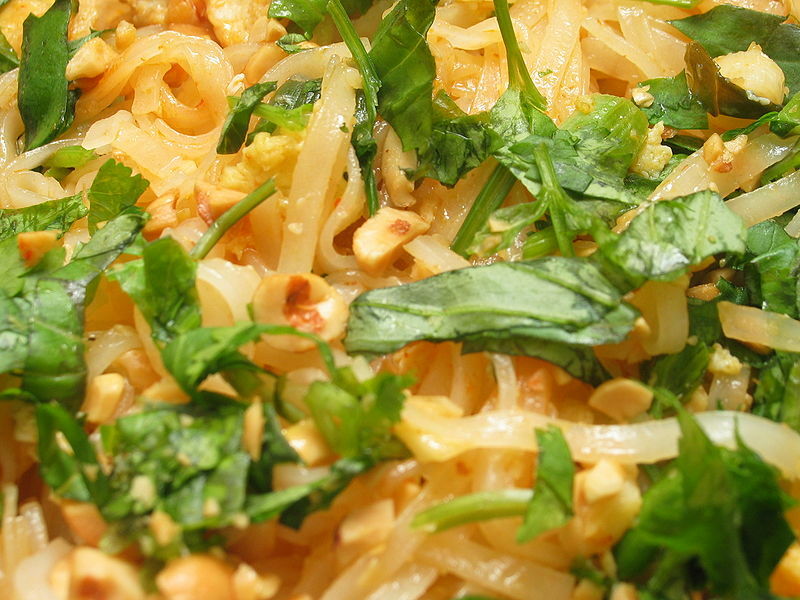 Pad Thai is one of Thailand's national dishes. Outside of Thailand, Phat Thai is one of the best-known Thai dishes, and is very popular in Thai restaurants in the United States, Australia, and other countries. Serve on a large plate or bowl. Garnish with chopped peanuts and optionally, chopped cilantro and a wedge of lime.